May 31, 2016, 10:52 PM · The Tokyo Disney Resort on Wednesday celebrated the grand opening of its fourth hotel — the Tokyo Disney Celebration Hotel. Unlike Tokyo Disney's three previous hotels, the Celebration is not an original hotel built on Tokyo Disney property. The Celebration is the former Palm & Fountain Terrace Hotel, located about about three miles from the Tokyo Disney Resort. 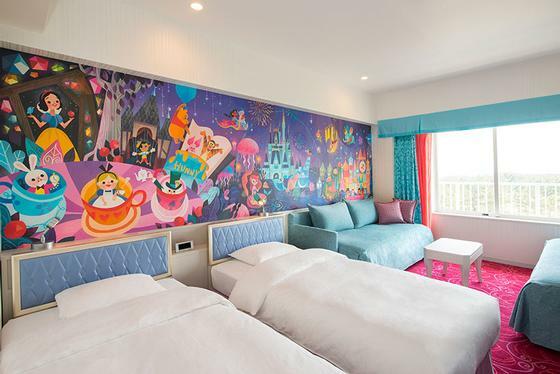 The Oriental Land Co., which operates the Tokyo Disney Resort under license from the Walt Disney Co., bought the hotel last year and has been renovating it for the past several months. The first phase of the new hotel, Wish, opened today, with the next phase, Discover, opening on September 10. Shuttle buses will carry guests between the park and the hotel, and guests there will be eligible for many of the same perks as guests at the resort's other three hotels enjoy, including early admission to Tokyo Disneyland and Tokyo DisneySea. In addition to Disney's Tokyo Disneyland Hotel, Ambassador Hotel, and Hotel MiraCosta (which stands inside Tokyo DisneySea), half a dozen non-Disney hotels also operate on property, connected to the two parks via buses and the resort monorail line. June 2, 2016 at 12:20 PM · That mural is adorable.